If you have a bubbly, thriving brown rice sourdough starter, then you are ready to start baking! I recently took this bread to a church fellowship meal and an out of town guest who has suffered from Celiac Disease for 20 years said that after trying many gluten free bread recipes, her long search was over! This gluten-free sourdough bread is it! She wasn’t the only one who thought so because there wasn’t any left! It is a beautiful, good tasting bread that slices well. 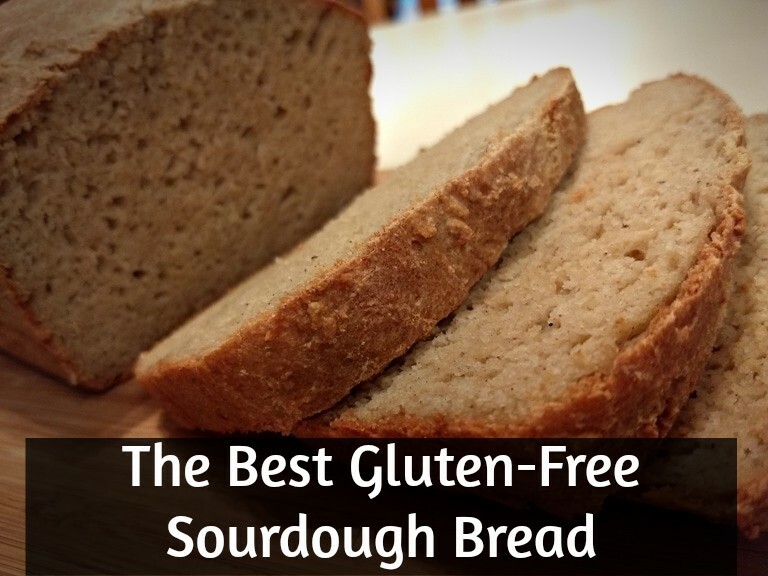 To print, download the recipe PDF: Gluten-Free Sourdough Bread. In a large bowl, melt butter and stir in water. Add starter, eggs, and honey. In a separate bowl, mix dry ingredients (NOT baking soda!! Reserve soda for just before baking.) Use a whisk or beaters to thoroughly blend in the psyllium husks. Mix wet and dry ingredients, beating with a mixer until very well combined. Cover with a lid, or plate, or plastic wrap and allow to ferment a minimum of 7 hours (12 hours is ideal). If you need to bake bread in less time, place in the oven (turned off) and turn on the oven light to warm things up and speed the fermentation process. After fermenting, when ready to bake, preheat oven to 400 degrees F.
Place bread pan in oven with oil or butter in it and allow it to melt. While it is melting, add baking soda to bread batter and mix thoroughly. Remove hot bread pan from oven and distribute oil around the pan, greasing all the sides. Scrape bread batter into bread pan and smooth the top. Reduce heat to 350 degrees F and bake bread for 50-55 minutes. After removing bread from the oven, allow to sit a few minutes. Run a knife around the outside to release from the pan if necessary, and then transfer to a cooling rack. Allow to cool and then slice. This bread was inspired by a sandwich bread at Cultures for Health. The original recipe uses xanthum gum, contains more starch, and a few other differences.